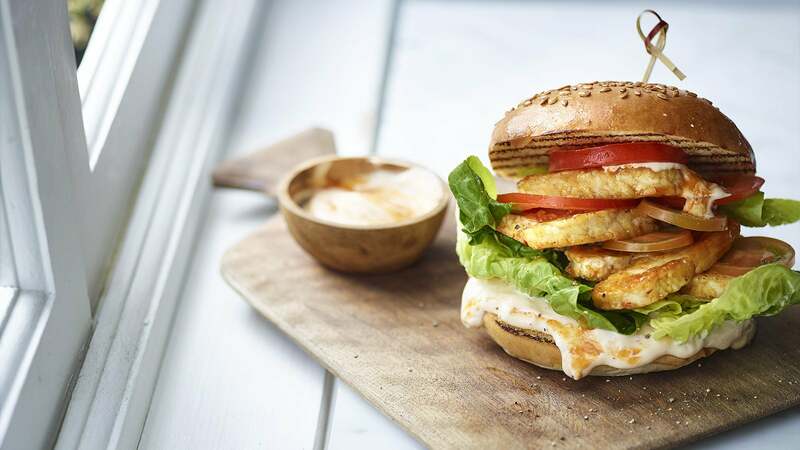 Make this delicious peri peri halloumi burger recipe from The Body Coach’s Veggie Lean in 15. Pour 2 tablespoons of the peri-peri sauce into a shallow bowl. Add the halloumi slices to the bowl and turn them so that both sides are covered in the sauce. Leave to marinate for a few minutes. While your cheese is marinating, stir the remaining peri-peri into the mayo. Separate the lettuce leaves and slice the tomato into rounds. Warm a dry non-stick frying pan over a high heat. When it is hot, chuck in the halloumi slices. Dry-fry for 2 minutes on each side, spooning any of the leftover marinade over the cheese as it cooks so that it becomes sticky and crisp. Take off the heat. Toast your burger bun, then spread the base with the spicy mayo. Stack in the halloumi, lettuce and tomato.